It’s difficult to avoid the passive pleasures of Santa Fe. Food and galleries are everywhere, tempting the visitor with sumptuous culinary and visual delights. Sidestepping touristas offers a bit of exercise, but not enough to justify three full meals per day. Tempted by the wine and chile festival in town last September, I made my way down to Santa Fe from northern Colorado to sample the event’s tantalizing combination of flavors. However, a bit late to register for festival’s events, I stumbled into another, less-advertised Santa Fe activity — hiking. Conveniently, strolling the forest trails instead of city sidewalks requires more energy and fuel. I found that fine food and hiking may be the best northern New Mexico pairing of all. After an excellent, fresh breakfast burrito at the unassuming but bustling and very friendly Tia Sophia’s restaurant in downtown Santa Fe, I linked up with state route 475 north out of the city into the Santa Fe National Forest. This road eventually dead-ends after 17 miles at Santa Fe Ski Basin high up the hill. Along the way, among thick forests of evergreens and aspens, are several trailheads worth exploring. One of them is at the far end of Hyde State Park and offers a nice circle loop of about 3.5 miles roundtrip. The trailhead is rather hidden on the left side of the road heading north from Santa Fe. After a heavy rain the night before, the trail was chilly and wet as I embarked. Gold aspen leaves littered the forest floor. The third week of September is reliably a good time to catch the changing aspens in Colorado and last year in northern New Mexico, the aspens were nearing peak color. The aspens in this section of New Mexico are very tall and stout. Other ground-level vegetation along the trail was bright green and golden, adding lots of color despite the cloudy conditions. Low clouds moved quickly across the sky overhead. The trail started off flat and wide, then ascended into the dripping forest. Small blankets of snow melted off the sides of the trail. After about three-quarters of a mile, a signpost appeared, marking the various routes one can take. I headed right. As the trail leveled off, views of hillsides across the valley appeared in the distance. Two mountain bikers passed me moving in the opposite direction, chugging up the hill in low gear. 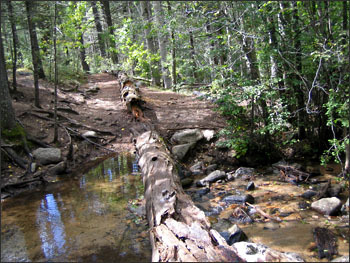 Eventually, the trail crossed a stream, Big Tesuque Creek, with two large trees offering passage across the shallow water. The sun came out briefly, warming the moist air. Pausing for an early lunch, I treated myself to a spicy ribeye steak and green chile tortilla “sandwich” purchased the previous evening from the Cowgirl Bar & Grill in Santa Fe. Delicious. Just beyond the stream crossing, another trail sign appeared. I took a left along Trail 254, aka Winsor Trail, which followed a creek. This trail is a good pathway into deeper regions of the forest, traversing up the mountain all the way to the ski area, and back to Bishops Lodge on the outskirts of Santa Fe. 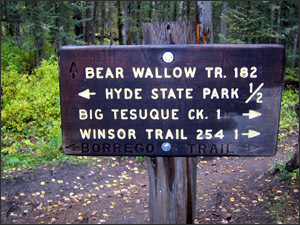 About a mile later along Winsor Trail (hiking southwest), another intersection signals Bear Wallow Trail to the left. This trail completes the loop. 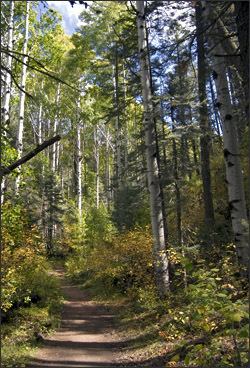 As more blue appeared in the sky and the day became warmer, groves of giant aspens appeared on the trail. Clearly, summer was slowly giving up its reign over the forest and the last displays of bright green and gold made this an excellent time to hike … and eat. Later that evening, seeking to quench a thirst after this mild hike, I ventured to Tomasita’s (like Cowgirl, within walking distance of accommodations in Santa Fe’s Guadalupe district). Near the train station in Santa Fe, Tomasita’s serves a mighty margarita. To temper the tequila, I ordered the blue corn chicken enchiladas, expertly prepared and served as requested with green chile sauce. While hiking in the forest means missing the often crowded thoroughfares of central Santa Fe, it offers a quiet beauty and departure from tourists busy snapping photos and slurping ice cream. And, when paired with the great food found in town, it’s a great combination for any adventure-seeker. I’ll return soon to sample the ample buffet of the Winsor Trail, well-stocked with fine northern New Mexican fare.